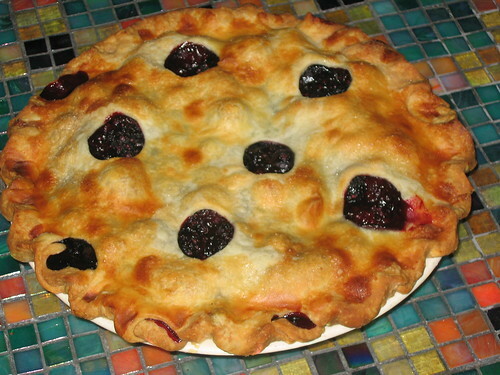 Pie Day Friday: The Early Bird Gets The . . .
And how lucky those early birds are! For the record, the Queen did not set out to make a breakfast pie. It was only as I was removing this week’s entry from the oven – and spilling bubbling pie lava on the floor -- that it even occurred to me that there would be leftovers. As a reasonable person, one who is concerned about muffin top waistlines and ugly displays of gluttony, the Queen is adamant about sharing. But this week the stars aligned in an unusual way: a farmer’s market crowded with succulent berries, an absence of dinner guests, a member of the royal family on work assignment in the Gulf Coast. The resulting constellation? Only three for dinner. And one fat pie. Filipinos are known to indulge in fried fish heads for their wake-up meals, whereas the Chinese might breakfast on congee rice soup with sliced pig’s liver. The Brits have their black pudding (don’t even ask) and I hear the Japanese like fermented soybeans. And you thought Belgian waffles were exotic. 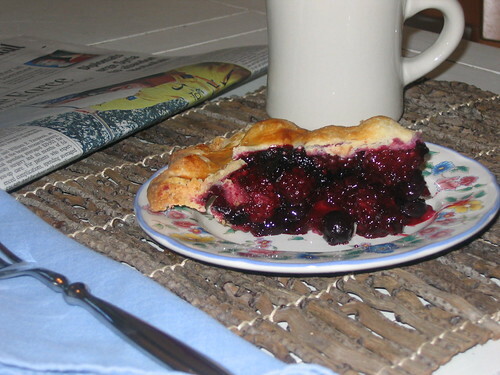 . .
A slice of jumbleberry pie on your breakfast table will help you face the morning without flinging up your hands in dismay at the state of the world and its attendant slew of tragedies. Bursting with a combination of blackberries, blueberries, and raspberries, it is the perfect antidote for a person who has spent most of the night dealing with a 110-pound Labrador with an upset tummy. 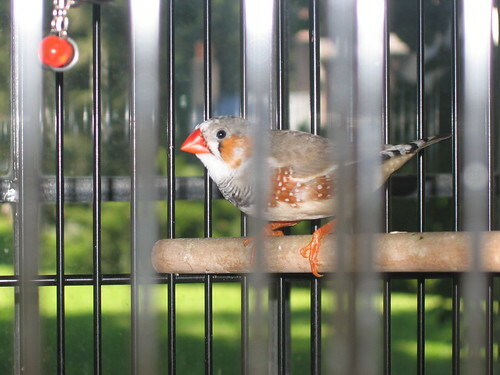 (You didn’t realize that the Queen resided in an animal kingdom?) Blanketed with its crisp, buttery crust, this pie is positively restorative. So what are you waiting for? Put down that Pop Tart and get to work! 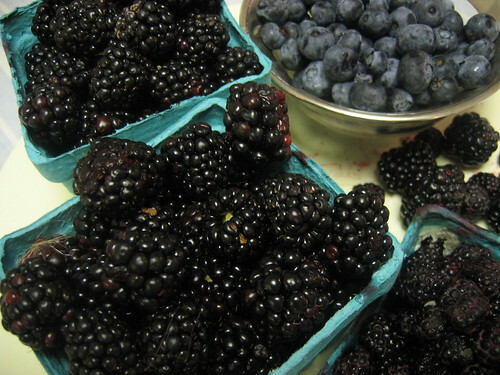 Although mid-summer is the right time to procure these kinds of berries, they don’t come cheap. In fact, just one of these pies contained over $15 worth of berries. Ouch. So, unless you have access to blackberry bushes – your own or those owned by somebody who won’t notice that you’re stealing from them – the Queen suggests you don’t offer to bring this pie to your family reunion. Although your 30-odd kinfolk would be delighted, you’d have to auction one of your children to pay the mortgage. There is a reason, after all, that God created the sheet cake. Heat oven to 450. Place a baking sheet on middle of oven rack. Whisk together dry ingredients in large bowl; toss with berries. Roll out half of dough and fit into pie plate. 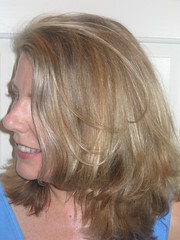 Trim edge. Refrigerate while rolling out top crust. Roll out remaining dough for top crust. (You may exercise your artistic expression by making polka dots in the dough; I used the lid of a Cointreau bottle for my masterpiece. Or leave plain.) Spoon filling into pie plate. Cover with top crust and crimp edges. Brush top of pie with milk and sprinkle with sugar. Cut several small slits in crust to vent steam. Bake on hot baking sheet for 15 minutes. Reduce oven temperature to 375 and continue to bake about 45 minutes more. Cool pie on a rack for at least 2 hours. Well, my offer for marriage stands. Oh wait, I did offer to marry you didnt I? As for pies for breakfast, I have long been proselytizing the wonders of good Cheesecake for breakfast. In fact I do believe that a good cheese cake, with a graham craker crust, may in fact be a perfect food. You need nothing else. Don't forget leftover pumpkin pie with whipped cream, part of this nutritious breakfast. Enough distractions, do you need any "independent" taste testers from across the street? Ok, one? OK, what are you charging by the slice? Currydude, I like *chocolate* pudding. Markb, The blossoming good health of her readers is The Queen's foremost concern. cjquinn, I've been known to scarf down cheesecake in the a.m., too, although we didn't call it breakfast. At 2 in the morning, nobody doesn't like Sara Lee. Bakerymaiden, You performed admirably in your tasting trial. More assignments are sure to be forthcoming. 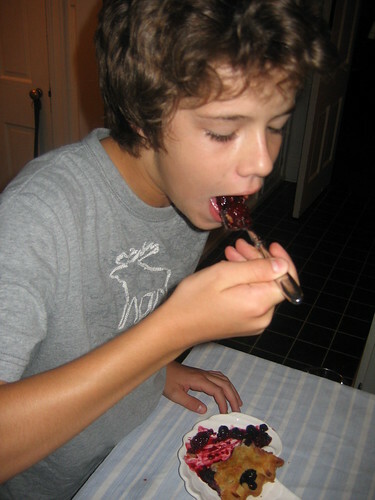 Could I substitute one berry for another? Right now Blueberries are on sale for 1.89/pt, while the others are sky high. in June, I usually can come up with a couple of quarts of red razzberries between my meager plantings and my Dad's thicket. Do the other ingredients work out right in this filling recipe as long the total volume of berries is the same? terry_jim, You can absolutely make substitutions. 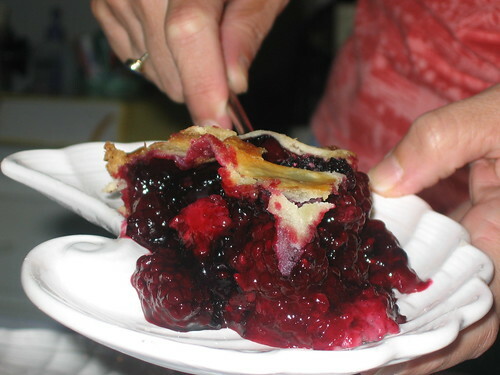 I find a whole blueberrry pie a bit flat in taste, which is why I try to include the tang of other berries. I used to climb a mulberry tree when I was a girl and I remember loving the berries -- although most of them made my mouth pucker since I refused to wait until they ripened! 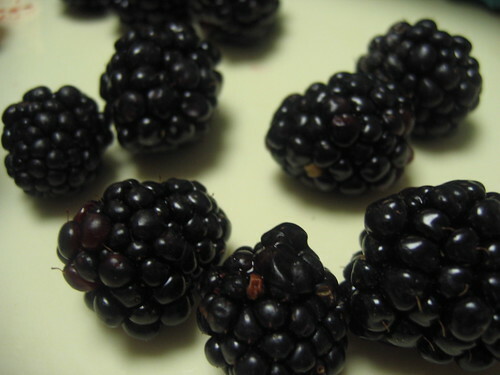 You can also buy good quality frozen blackberries for less than fresh. Enjoy!